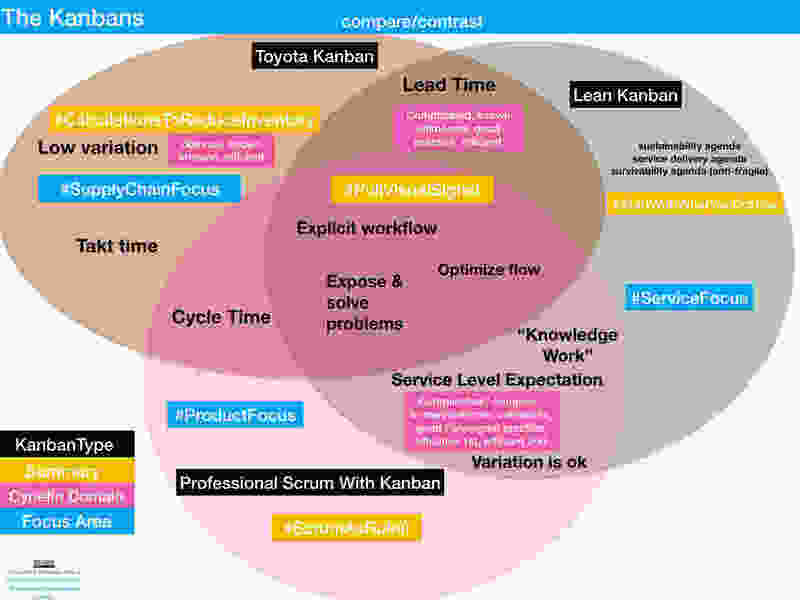 Professional scrum with Kanban came out in February 2018, and it can be found at https://www.scrum.org/resources/kanban-guide-scrum-teams. 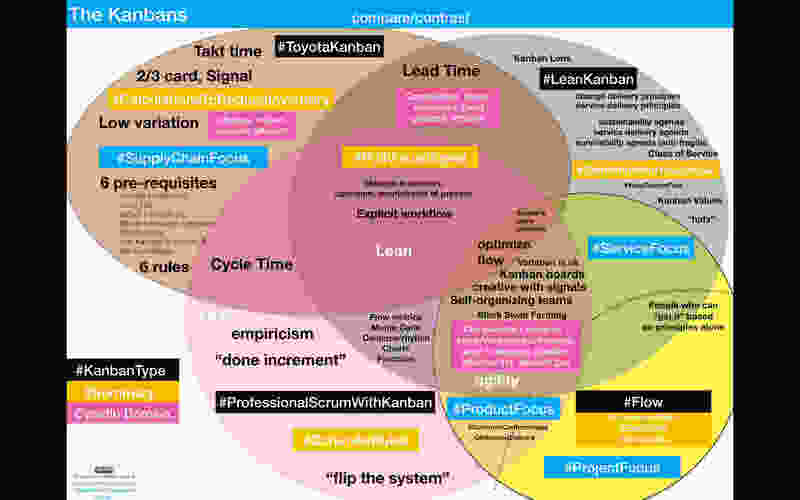 The Lean Kanban method is described in the Essential Kanban Condensed Guide, that's at https://leankanban.com/. 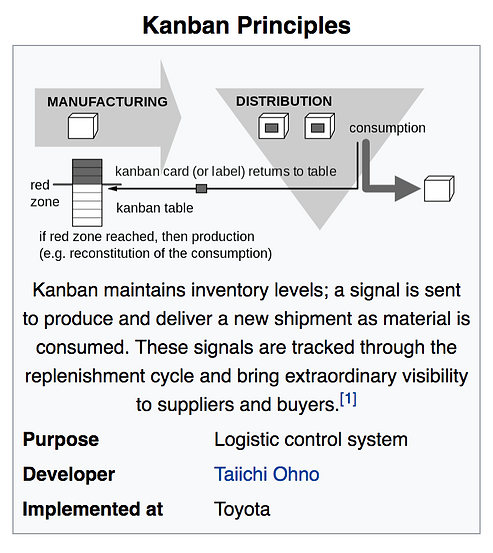 The original Toyota Kanban has been around for a little longer (see https://www.youtube.com/watch?v=zkQxvkXSiuA), not to be confused with Kaizen as per https://www.youtube.com/watch?v=wot9DFzFRLU or https://www.youtube.com/watch?v=E6rRHqb5MV0. This video at https://www.youtube.com/watch?v=5izyN66PTxs in two minutes the original Kanban and Kanban for knowledge work. I was first introduced the original Toyota Kanban (see https://en.wikipedia.org/wiki/Kanban) at a factory in Ireland for a key partner for a global computer company. I remember people picking components from pairs of bins, focusing one bin of each pair at a time. Kanban aligns inventory levels with actual consumption. When a bin would empty a flag would raise signalling "please replenish me" to the chap from the warehouse watching for such signals from the end of the assembly line. After all, he could not put the entire warehouse on the line. This was just in time replenishment, as the other bin of the pair was not being consumed while the operator proceeded with her picking work. The size of the bin was important relative to the components in the bin, as the warehouse chap needs enough time from the signal to get parts from the warehouse to replenish the now empty bin of the pair before the other bin empties also. Allowances to be made for variation, how long the warehouse chap will take to see the signal, respond to the signal, complete replenishment, multi-tasking of the warehouse chap, production pace, and the supply chain for those components to even get them into the warehouse based on a supply-chain system. All sorts of charts were used to figure out the sweet spot, as there were many pairs of bins, one pair per component as I recall. Indeed I also saw a CONWIP (see https://en.wikipedia.org/wiki/CONWIP constant amount of work in process) system, with constant replenishment of 1 large component per pull signal, this could help in the event of a fit of purpose replenishment time (to avoid unfit for purpose waiting - I mean this is the literal sense, I am not referring to David Anderson's book on that topic - good book by the way). 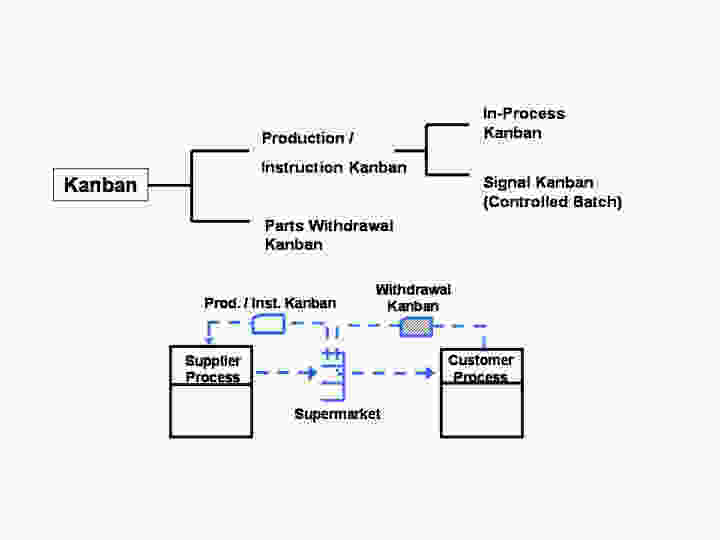 Each process issues requests (kanban) to its suppliers as it consumes its supplies. Each process produces according to the quantity and sequence of incoming requests. No items are made or transported without a request. The request associated with an item is always attached to it. Processes must not send out defective items, to ensure that finished products will be defect-free. Limiting the number of pending requests makes the process more sensitive and reveals inefficiencies. We also know from Theory of Constraints that excess inventory is typically a sign of a badly designed system. Throughput accounting rather than Cost accounting is recommended to avoid "silly games". I saw a speech this year from a kind of famous guy who won a Finance Wizard of the year award and showed his prison card from the same year:). I think he took to to the extreme, I jest of course:). See https://www.youtube.com/watch?v=t_x3F3v6xBY&t=54s . An example of a simple kanban system implementation is a "three-bin system" for the supplied parts, where there is no in-house manufacturing. One bin is on the factory floor (the initial demand point), one bin is in the factory store (the inventory control point), and one bin is at the supplier. The bins usually have a removable card containing the product details and other relevant information—the classic kanban card. When the bin on the factory floor is empty (because the parts in it were used up in a manufacturing process), the empty bin and its kanban card are returned to the factory store (the inventory control point). The factory store replaces the empty bin on the factory floor with the full bin from the factory store, which also contains a kanban card. The factory store sends the empty bin with its kanban card to the supplier. The supplier's full product bin, with its kanban card, is delivered to the factory store; the supplier keeps the empty bin. This is the final step in the process. Thus, the process never runs out of product—and could be described as a closed loop, in that it provides the exact amount required, with only one spare bin so there is never oversupply. This 'spare' bin allows for uncertainties in supply, use, and transport in the inventory system. A good kanban system calculates just enough kanban cards for each product. Most factories that use kanban use the coloured board system (heijunka box). Here is a kind of funny video demonstrating the original kanban in action - https://www.youtube.com/watch?v=NmGdAbNB7TE. Or a more serious if dated example from Toyota at https://www.youtube.com/watch?v=P-bDlYWuptM. For a two-bin scenario like the one described above, Kanban calculation variables for a signal kanban system include monthly demand (MD), changeovers per month(CO/M), average daily demand (AD), replenishment lead time (RT), safety factor (SF), and container quantity (CQ). Two bin kanban requires smoothing of production, whereas knowledge work Kanban does not require smoothing (although right-sizing is recommended). There is a difference in interpretation of terms like cycle time, lead time. Ok, so roll on to roughly 2007 (I think), Kanban for knowledge work came about and as far as I know, its creators forgot to give it a name. The name came later. The Lean Kanban method is a start with what you do now method that gets signals from Kanban boards, but it's much more than that. Thankfully, the Essential Condensed Kanban Guide was launched in early 2016. The Lean Kanban method is described in the Essential Kanban Condensed Guide, that's at https://leankanban.com/. I won't try to explain it here. Professional Scrum with Kanban was launched in early 2018, ending the debate of either/or, and provides very useful support for Scrum teams who are already also using Kanban. See my blog post on how effective that is. Professional scrum with Kanban came out in February 2018, and it can be found at https://www.scrum.org/resources/kanban-guide-scrum-teams. I won't try to explain it here. I was slow to pick up on Flow in late 2017, initially putting in down as another Kanban, but it's a lot more with faster cycles & outside in experimentation, supported by DevOps. See https://www.flow-academy.org/. Lean Kanban and Professional Scrum with Kanban are strong with optimization of flow, metrics, workflow definition, design & management, and probabilistic forecasting. Flow is stronger with alignment, faster cycles, and outside in thinking, for now. Here is my attempt at a comparison/contrast. Apologies in advance if I'm not doing them justice. I put this together in just a few hours, and I'm not saying it's right (ok that's my dampening strategy:)). I would appreciate input from experts on Lean Kanban (Lean Kanban University), Flow (Flow Academy), Professional Scrum with Kanban (Scrum.org) and Toyota Kanban from the traditional world of Lean.